Tyler and Kate Lowry with Ellie. THE GESTURE THAT CHARMED KATE'S GRANDMOTHER: When Tyler stood up to greet her the first time they met. Kate and Tyler are digital marketers. At dinner, they talk shop: brainstorming, encouraging, critiquing each other's ideas. But it's different when the item you're marketing is yourselves. They spent the summer of 2016 working with A Baby Step Adoption. They got life insurance, met with a financial adviser. Then it was time to prepare their profile book, the collection of photographs and stories that birth parents would peruse. They began with gratitude: "Thank you for even being interested in us. We're honored that you chose to turn the page." The book detailed their childhoods — Kate is the ninth generation of her family to grow up in Lancaster, and Tyler was raised in Chestnut Hill — described how they met, pictured their black Lab, Abby, their families, their friends. At the end, Kate included a photo of a rocking chair with a teddy bear on the seat. "I hope you can help us finish our story," they wrote. 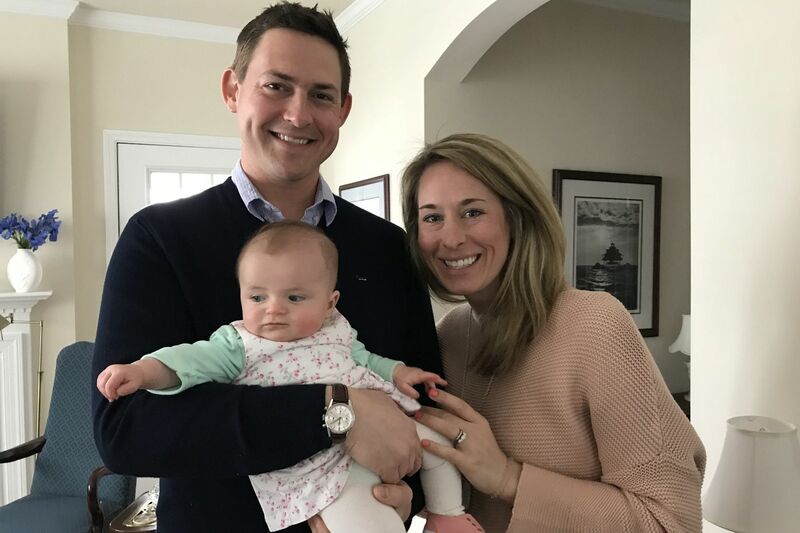 That story began in 2001 — Kate was just 18, a first-year student at Washington College on the Eastern Shore of Maryland, and Tyler was a sophomore. Someone was holding a "red light/green light" party — the idea was to dress in red if you were dating someone, yellow if your relationship status was uncertain, and green if you were available. Tyler had casually asked Kate to the party. When she opened her dorm room door that night, he was dressed in red. She was in green. "Who are you dating?" she asked. "You," he said. A week later, Kate borrowed a pair of much-too-large cowboy boots from Tyler — he trained horses at a nearby stable while in college — for a costume party. "I took them back the next morning, we got breakfast, and the rest is history," she says. After college, they were living in Flourtown, in a renovated 1850 chicken coop, when Tyler proposed. He'd already asked Kate's father — the two men huddled beside a backyard grill on a frosty Thanksgiving Day. Tyler had planned to propose at Christmas. But he couldn't wait. On Dec. 4, they were at home. Kate had a stomach ache, and Desperate Housewives was on television. Then their propane ran out; later, she lay in bed, bundled in three pairs of sweatpants and two hoodies, staring at her ring in the moonlight. In 2006, they moved to Lancaster — where Kate was working, where her family lived and where the city was undergoing a small urban renaissance — and were married there a year later. They envisioned a family of three. But pregnancy didn't happen — not after a series of gynecologists encouraged them to "just keep trying," not after an early miscarriage in 2012, not after a fertility specialist diagnosed a misshapen "unicorn uterus," not even after hormone shots and intrauterine inseminations and Kate's panic attacks from the stress of it all. "I felt like I'd lost control of myself," she says. "Then it was like: Stop. Let's stop. Let's chart another course." Both are avid learners, inveterate planners. They spent six months researching adoption: calling agencies, listening to webinars, talking with adoptive parents in Indiana and Tennessee. "I needed the real story," Kate says. "What happens if you don't get a baby? What happens if the birth mom backs out?" They finished the profile book and paperwork by early 2017. It was the week of the Kentucky Derby — Kate was in Louisville for work — when their caseworker called. A birth mom named Kristine, then 14 weeks pregnant, had chosen them and wanted to talk by phone. Kristine lived in Los Angeles, and her caseworker was in Maine. Tyler was home in Lancaster. "We all got on the phone. My heart was in my throat. Kristine's first question was, 'Who did you vote for in the election?' " Kate says. The caseworker had told the pair that Kristine was an avid Democrat, and that politics would likely be on her agenda. Kate and Tyler told her about going to hear Obama speak in Lancaster, about their commitment to education and to letting any future offspring make up their own minds. At the end of the call, Kristine said, "I've already made up my mind. It's up to you guys." "And we adored her," Kate says. The three began to talk by phone regularly; Kristine sent text messages, photos, and images of her ultrasounds. When she was seven months pregnant, they met in Los Angeles and spent the day touring the Hollywood Hills and Venice Beach. They were in L.A. again in early November, to be with Kristine for her scheduled C-section, when her water broke. Kate was in the delivery room when Ellie was born — a 5-pound, 3-ounce pipsqueak with personality, she says. "All of a sudden, you have this child in your hands," Tyler says. "You have that realization: My life is absolutely different than what it was two seconds ago." They spent several days at the hospital, in a room with Ellie, while Kristine recovered just down the hall; when they slipped out to do errands or shower at their rented place, they left the baby with her birth mom. "They're bonding," the nurses cautioned. "But I trusted Kristine," Kate says. That trust continues. The three talk often, send pictures, and envision a meeting in Chicago or Philadelphia when Ellie is old enough to understand. It was their passion for history that made them want to have a child. "When you walk around our house, everything tells a story. We didn't want those stories and memories to be lost," Kate says. Now, Ellie brings her own backstory into that mix. Tyler knows she might eventually ask questions that are hard to answer, such as, "Why was I adopted?" "We'll take it step by step," he says. "Those are huge questions, and it's tough when you don't have an answer immediately. But that's part of being a parent. You're not supposed to have all the questions answered."